Colors from nature, fashion magazines, inspiration is all around you if you only start looking! Slip stitches. There are so many diverse patterns and it is an easy way to introduce the idea of using more than one color in your knitting projects. I provide a range of 3 to 4 sizes, ranging from 36-38” finished circumference at the small end of the scale up to 51-52” finished. I provide a range of sizes for knitters whose fitting problems I understand. Larger sizes have special fitting needs that require more personalized assistance. When I first began selling my designs, I was told my designs were “quirky”. I thought my designs were very wearable for many people, so I didn’t agree. With experience, I now consider that “quirky” assessment as meaning I have my own voice. When knitters look at my work, they can see my design signature. I try to remain true to those instincts so I don’t spend a lot of time looking at other designers’ work except to appreciate their artistry. Patterns should be accessible to as many knitters as possible. That being said, when I was learning to knit, I would consistently choose projects that were beyond my technical ability – that’s how knitters learn. At the time, I loved the process of figuring out how to do those projects. My theory is, if you want to knit the project enough, you’ll spend the time and effort to learn how to do it to the best of your ability. “Dumbing down” isn’t necessary; most knitters will “rise to the occasion”. I don’t have test knitters working for me. I work with Buffy Taylor from Shelridge Farm. I knit a prototype for each design. Buffy does the first test knit. Because she prefers 2 colorways for each knitting kit, we’ll both do a 2nd test knit version using the alternate colors. Altogether, each design is knit at LEAST four times, so we catch most of the errors. I’ve been fortunate to have several mentors over the years. The DKC in Toronto, Canada encouraged me to develop teaching workshop skills at their events. Buffy and Don Taylor are a great source of information about the retail aspects of designing. Cheryl Oberle noticed my work at the Shelridge Farm booth at Stitches events and recommended me as an instructor to the organizers. My husband, George Jamieson, helps guide me through the business decisions and details of running a small business. Tremendous. My son, Jack, is the computer whiz our family. It was his idea to have a website for my business, http://www.kinverknits.com/. Initially, I thought it would give people a opportunity to see my designs and read about the workshops I offer. 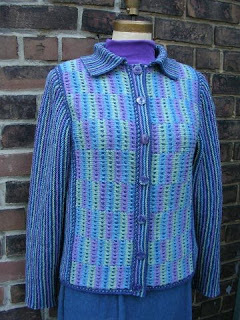 The response was wonderful and knitters began to purchase my patterns and kits on-line. The Internet sales are now a significant part of my business. When developing designs for my company, Kinver Beach Knit Design, Buffy Taylor does the test knitting and acts as a Tech Editor. Ah, that’s the difficult thing! I love designing; I love passing information on to fellow knitters; I love traveling all over North America meeting knitters, retailers, and fellow teachers. It is difficult to say ‘no’ to opportunities that arise. However, I’ve just moved to the West Coast and I’m looking forward to taking more walks, exploring Victoria, and delighting in all the new colors around me! I strive to provide quality products, to give knitters new techniques and experiences, and to provide assistance and answer questions. I think of feedback as food: you don’t just put a strange, new food in your mouth; you put it on your plate and examine it; then you put it in your mouth if you are going to benefit from it. I look for criticism that speaks to what I’m trying to do and will help me achieve it. I was delighted with the response to my designs. It took several years until I had developed a body of patterns and workshops that could provide an adequate income. During that time, my husband liked to say that he was supporting the arts on a personal level! When I was a young person studying fashion design, during the first week of classes in 1st year one of the instructors said, “If you want to make money, go down the hall to the business department. You’re sitting here because you HAVE to be here. Otherwise, you’d be better off devoting yourself to something else.” I think the same holds true for a career in knitting.